Majorelle Gardens. A beautiful garden and one of the highlights. 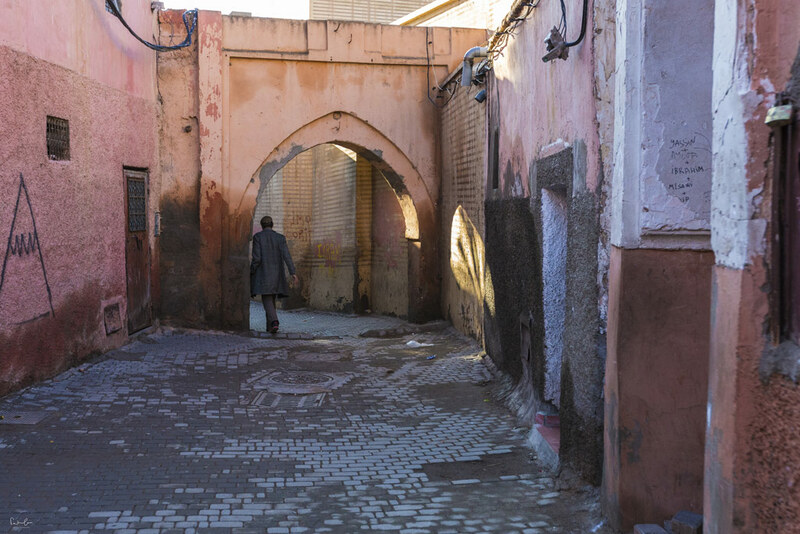 Traveling solo: is Marrakech „safe“? Moroccans are very welcoming and friendly to visitors. If you smile, you will certainly receive a smile back. 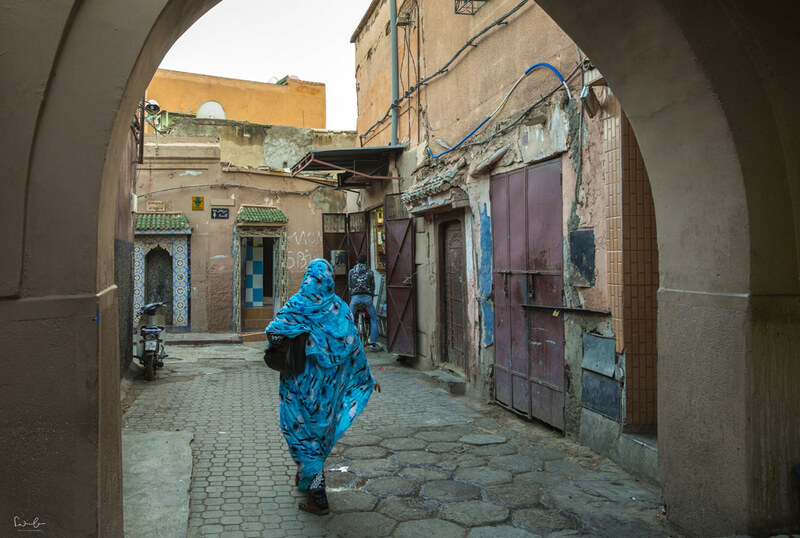 The most frequently asked question is probably: Is Marrakesh „safe to travel solo“, especially as a woman? My vote is yes. It seems to be a very safe place where tourists are welcome and no one wants to do you any harm. However, I figured some alleys are really dark at night and I would have had an uneasy feeling if I’d had to walk there alone. Besides the very friendly people in Morocco you might also find some obtrusive men and their behavior can be really annoying. Safe is a term everyone defines differently, that’s why I quoted the word. To me, a place is safe when I feel good and free to walk around, even at night, without fear of being robbed or followed. 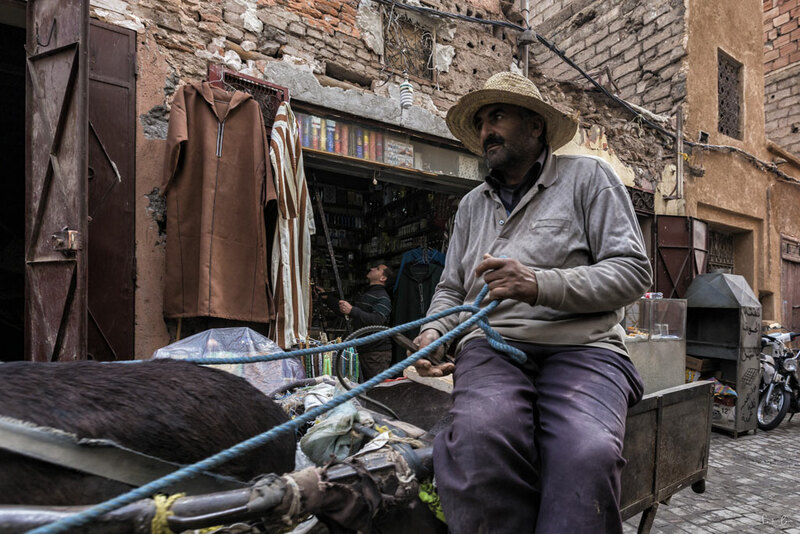 Tipp: Look out for the calligraphy merchant near Ben Youssef Madrasa! Marrakech and Taxi. A complex story. Getting a taxi in Marrakech is easy. Really easy. Theoretically. Here’s the thing: All taxis have a taximeter, but the drivers refuse to use it. They all try it with a fixed tariff which is way above the amount you would pay with the taximeter. A local told us that you would never pay more than 25 Dhr with the meter on. But of course, the drivers try it. The best advice I can give you is to walk away. Some offer you a reduced rate and some just don’t care and let you go. They’re sure to get another tourist who will be willing to pay the amount they state. The better advice is to stop a taxi from the street rather than from a square or taxi stand. Riads are wonderful. You never know what’s behind the doors and most of the time you would not expect what you see: A beautiful patio with nice little tables and chairs, some with a pool. 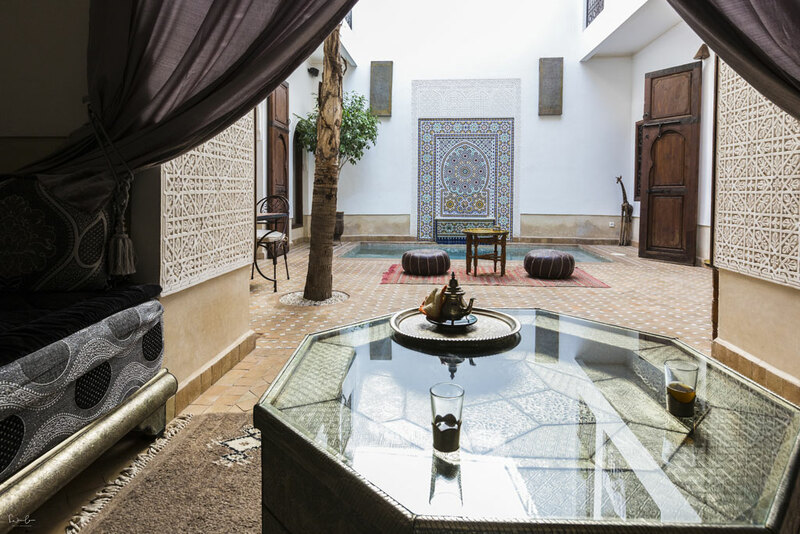 And all of them spread the Moroccan charm and have the typical interior: the colorful tiles in patterns, the silver interior design accessories, the comfy sofas and a rooftop terrace. What I really like about Riads is the familiarity, especially when you chose a smaller, not famous one. My experience is, that Riads are safe because there is always someone who sits at the door and knows the guests. And the people working in the Riads are extremely friendly and nice. However, choose your Riad wisely. It might be somewhere not accessible by car, so it means you have to walk narrow alleys to reach it. That’s charming too, but you might not feel super comfortable when you have to find it at night, especially when traveling solo. And one other thing about Riads you should consider: if you travel to Morocco in one of the winter months, bring lots of warm clothes. It gets really, really cold at night and in the mornings and the Riad’s patios do not have a roof. I heard and read lots of posts and articles about the amazing food in Morocco. Honestly, it didn’t kick in. You get the same dishes everywhere you go: Tajine, Couscous and Bastilla. On my first night, I had a Chicken Tajine, because I remember having tasted a Tajine in Vienna once and it was delicious. But the Tajine in Marrakech was literally disgusting. It seemed the chicken had seen better days, it simply smelled old. 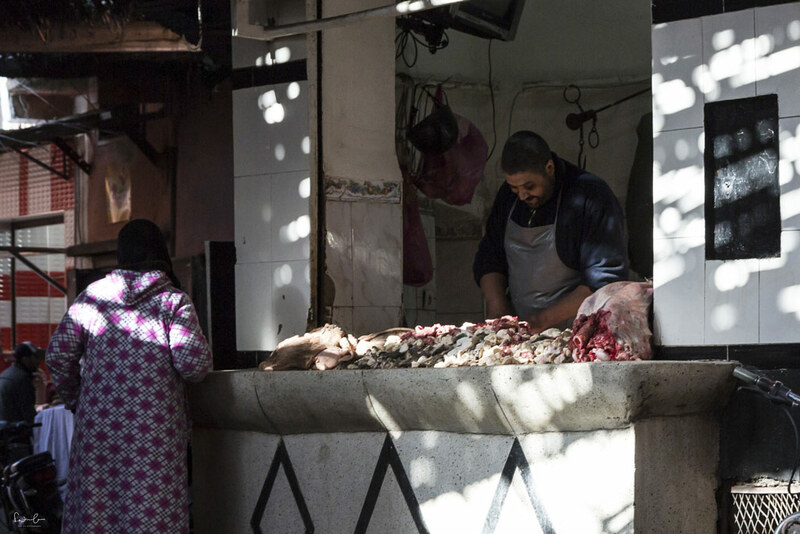 After that and after seeing the meat stalls in the souks I decided to be vegetarian for the time in Marrakech. I tried vegetable couscous the next day: the taste was boring and the vegetables cooked too well. 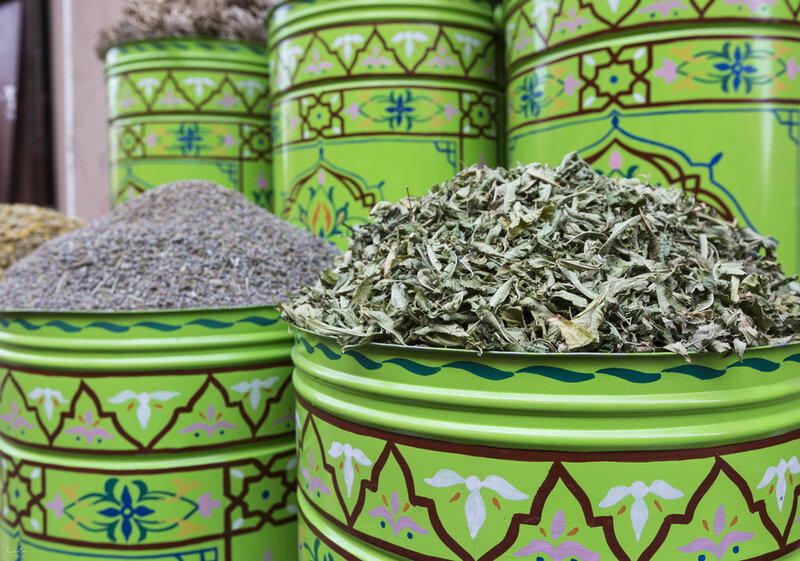 Where were all these amazing herbs and spices? Ok, I admit, I am not the foodie in person, but I found that the food was not spectacular and tasty at all. Oh, and if you think you can have a glass of wine with your Tajine or Couscous, you might be wrong. Many or even most of the restaurants do not serve alcohol. Not that it is super important, but honestly, I love my glass of wine when I dine and travel. Café Arab, for example, serves good food and wine and cocktails. 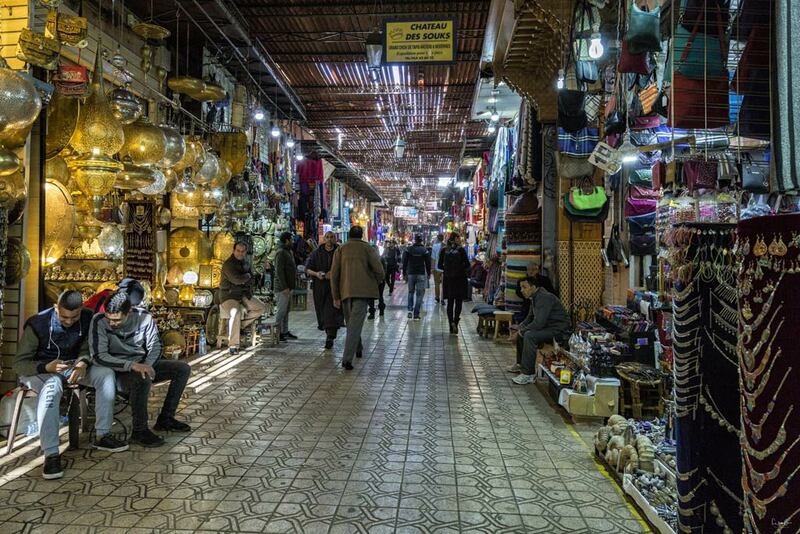 They’re like a different world that swallows you once you enter the maze of the souks. The colors, the smells, the crowds, the marketers who want to sell you their goods for a great price. 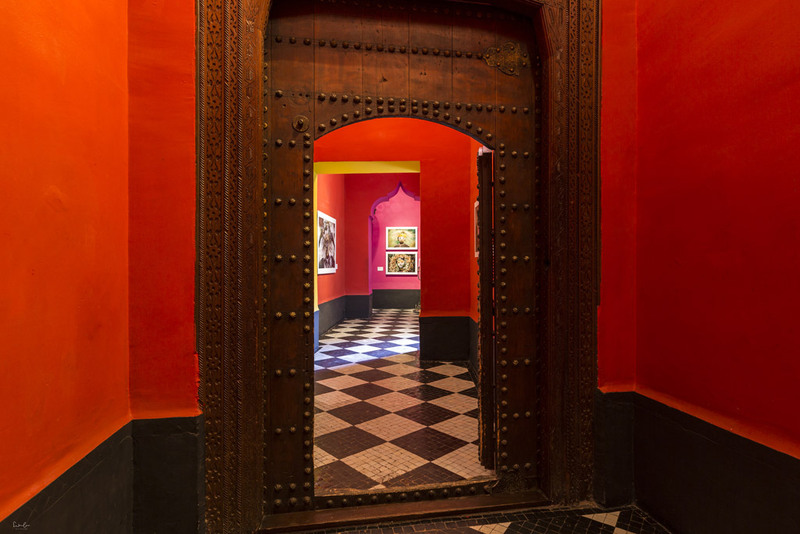 „Come in, just looking, where are you from, welcome to Marrakech“. 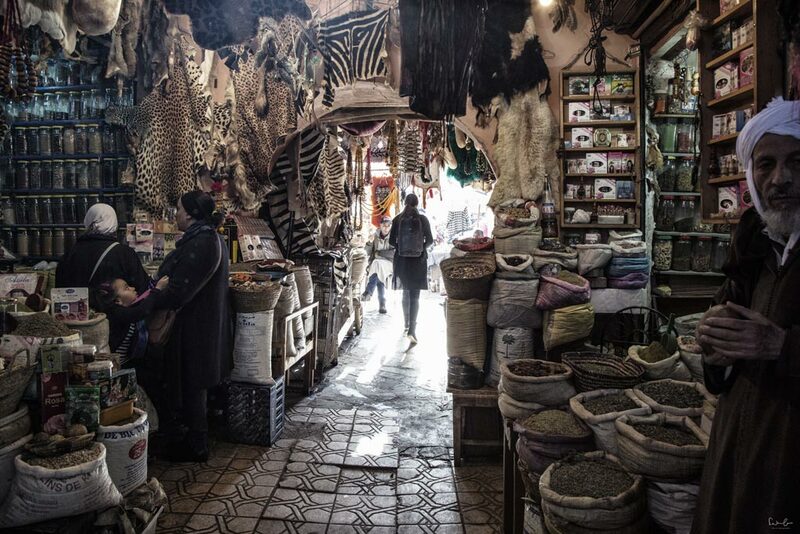 It is an amazing world you find in the small alleys of Marrakech and it is an exciting experience to buy something. If you’re a good bargainer depends on your acting skills, steadfastness and the desire for the product. The first price you are told is way above what you should pay. If there is something like a general rule, the final price is at around 70% below the first one. Bargaining is a funny thing to do and it belongs to the culture. I bought some things in the souks but after a while, the procedure started annoying me. Once you show interest in something, it is really difficult to get out without buying and if you make the mistake to be in the store and try to leave, the seller is kind of blocking your way out and it takes you a while until you’re able to escape. I forgot my GlocalMe mobile hotspot at home so I was bound to the hotel wifi. Do you need wifi to navigate through Marrakech’s jungle? No. You will get lost a couple of times, be sure of that. But I heard stories coming out of the souks and finding yourself in an area where tourists should not go. I can’t confirm that. You can still use google maps without wifi as an orientation. It shows your location and the spot is moving with you. The best advice I can give you is to get lost in the streets of Marrakech without having an actual destination. The main plaza Djemma el-Fna is the heart of the Medina. Hundreds of Moroccans are offering their products and attractions to tourists hoping to find people to buy and pay. Kobras dancing to the sounds of the Pungi (that’s the flute) or little monkeys showing their tricks still attract people and they still pay a few Dirhams. Peeps! This is bad. A cobra is actually deaf, so they do not dance to the music, they move because they feel threatened. Rumors say that the snake charmer defangs snakes, however, the Moroccan contradict this statement. They say they treat the snakes like their children, feed them and make sure they are healthy. Moroccans don’t like big notes. Make sure to always have some change with you for taxis, entrance fees, food stalls and the souk. Pay with the big notes in large restaurants. This is one thing you must do when you’re in Morocco. A hammam is a place to meet, a place for tranquility and relaxation. It plays an important role in the social life of Moroccans. Men, women and children love the ritual of black soap and body peeling. Depending on the budget you can experience the body wash for locals for a few Dirham or you choose the tourist hammam. Either way, your body feels soft and clean after that. 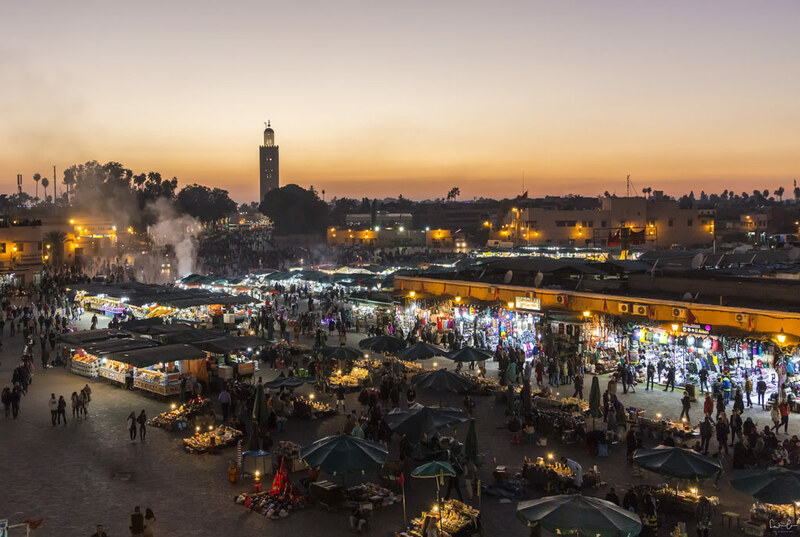 When is the best time to go to Marrakech? 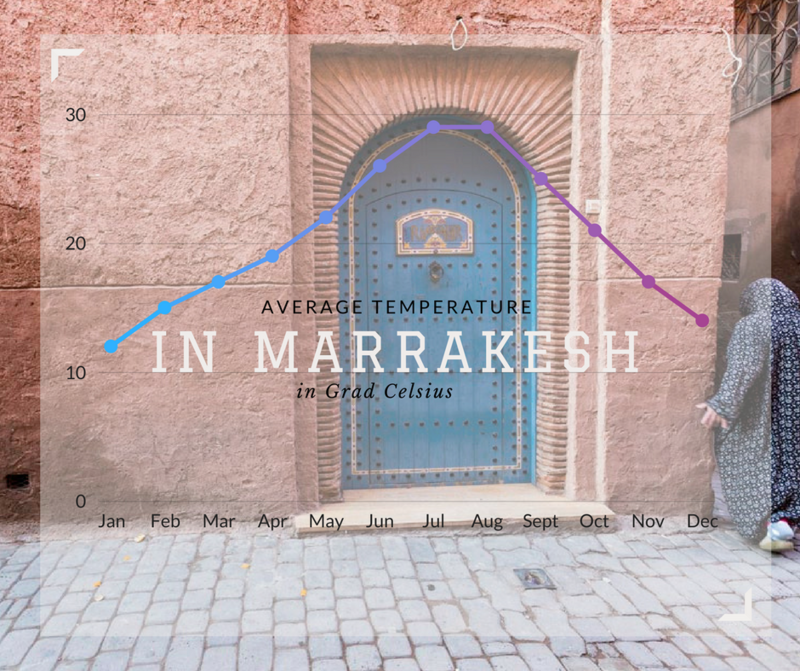 Marrakech is a whole year destination however it gets freaking hot in summer and a bit chilly in winter, too. I traveled in December and checked the temperatures before in order to make sure to pack the right stuff. The forecast said 18-20 degrees (Celsius) during the day and I ignored the single digit number in brackets. Don’t do that! Marrakech is practically in the desert and it gets really cold in the evenings and mornings. It’s not like the Mediterranean where sunny 18 degrees feel like 24 or 9 feel like 15. Bring layers and pajamas if you intend to go during one of the winter months and remember that there’s no heating in the Riads. The summer months, however, get really hot and you will be happy to spend time in the patio of the Riad to cool down. What to wear in Marrakech? I was laughing when an English bloke told me to be at the airport two hours before departure. Sorry for laughing, dude. You were so right. Be prepared that the online check-in does not work. And be prepared that the check-in at the counter takes ages. I don’t know if they’re typing a novel, but it is a lot of information they enter until you finally get your boarding pass. And then you’ve got to show your passport about 6 times unless I miscounted. It was low season and it took me 50 minutes until I reached the gate. I’m pretty sure it takes much longer in high season. So, take the two-hour advice seriously. So, did Marrakech kick in? I loved the colors and the hospitality of the people. I enjoyed wandering through the souks and I think the architecture is absolutely amazing. 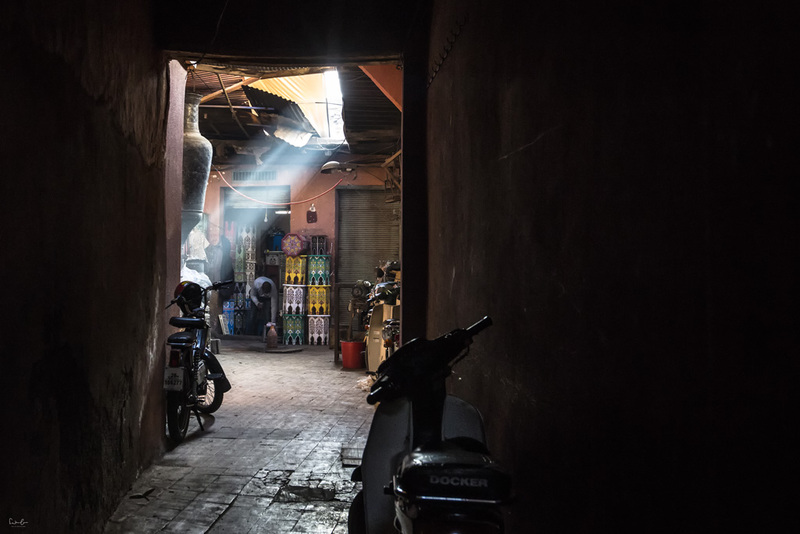 Marrakech is an awesome place for photographers and you can take the best street photography shots there. So why am I missing this excited feeling I heard from so many people who have visited Marrakech? Was it because I was stupid enough to think 9 degrees will suddenly be 19 and I was literally freezing pretty much the whole time I was there? Or was it the annoyance I felt on my last days when it seemed that the guys were more obtrusive than the days before? 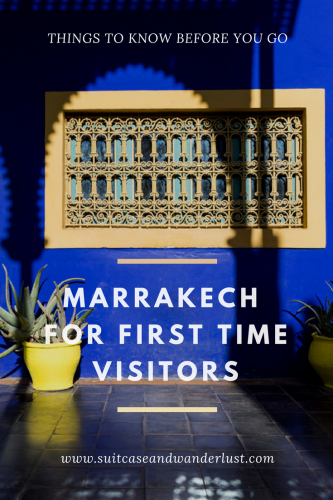 I want to believe Marrakech deserves a second chance… What’s your call? Thanks for your comment Nafisa. I’m glad you find my tips useful! Thanks for the very useful and practical tips and addressing the main concerns, i’ve often heard horror stories and wondered whether it was worth going. There are a lot of stories out there and I’m pretty sure some are true. But Marrakech is definitely worth going. I’d really, really love to visit Morocco. What a great resource in case I get that chance. Thank you very much! I hope you can visit Morocco soon. Ohh can’t wait to go! I’ve been dying to get to Morocco and really appreciated the honesty of this post! Thanks!!! Thank you very much, Jocelyn! Interesting article, I really want to go there soon but I’m in 2 minds about travelling on my own! Your tips are realistic, thanks for sharing! Thank you very much, Mayuri. This looks like a lovely place ! Never heard of it but now I wanna go !! 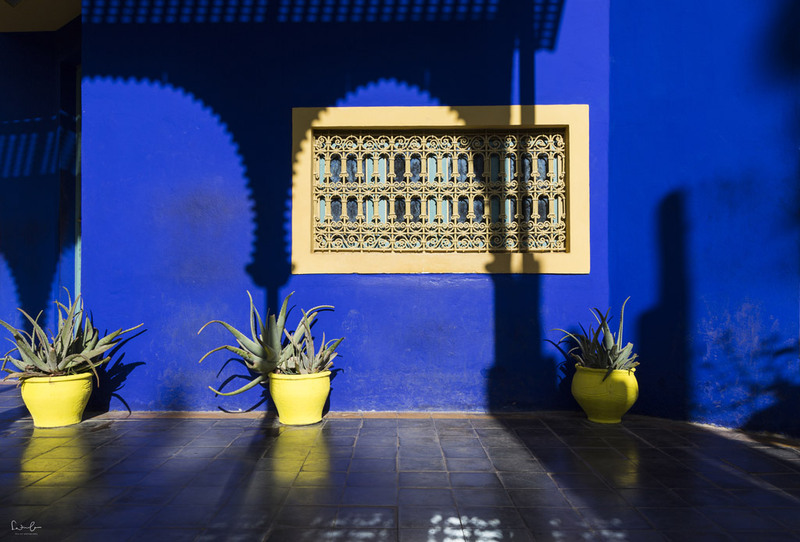 Marrakech is so colourful and still on my list to go! I should really bump it up my list after reading your post. Very thorough! I love that you mention being respectful about clothes. You’re right -welcomed visitors should be aware and understanding about the differences – and arrive prepared!